Traditional keyboards have an integrated number pad on the right hand side which forces the mouse further away from the user and can cause Repetitive Strain Injuries (RSI). Our number pads work in perfect combination with our mini keyboards to bring the mouse in closer to the user and reduce strain on the shoulder, forearm and wrists. Wireless number pads are available to offer an ergonomic solution to mobile workers. Our number pads are designed to be positioned on the opposite side of the keyboard to the mouse. This ensures a more ergonomic and comfortable working position by enabling both left or right handed users to position their mouse in closer proximity to the body - avoiding 'reaching' for the mouse. 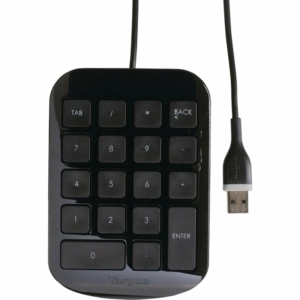 If you are right handed your ideal setup is a mini keyboard with the mouse positioned just to the right of the keyboard and the number pad positioned just to the left. If you are left handed then the mouse and number pad positions would simply switch. Order a number pad online today!